Poppy Cottage is a charming semi detached Cornish self catering holiday property in the popular, unspoiled village of St Agnes. The village was originally founded on tin mining and has since become a popular coastal resort. The imposing ruins of engine houses and chimneys dominate the skyline and there are coastal paths offering splendid views of the area's magnificent, rugged and unspoiled coastline. There is an abundance of plant, animal, bird and sea life just waiting to be explored, changing with the season. 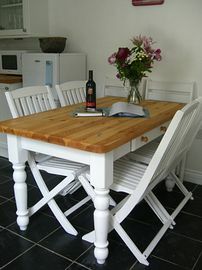 The cottage is comfortably furnished with lounge suite, TV/DVD and Free view. 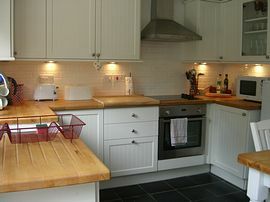 Kitchen with slate floor and newly fitted range of white units. A door leads to the rear garden. 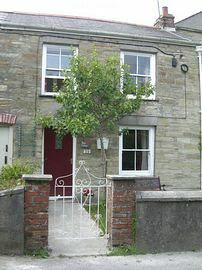 Stairs to the first floor with 3 double bedrooms, all comfortably furnished. The bathroom has a bath with electric shower over, wash-basin and WC. 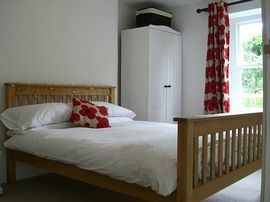 Bed linen and electricity are included. The accommodation has been lovingly renovated and now provides comfortable guest accommodation whilst retaining many original features such as the solid wood floor and beamed ceilings. To the front is a small enclosed garden and to the rear is an enclosed garden with furniture. There is unrestricted parking on the road outside the cottage. A convenience store, wine bar and pub are all within a couple of minutes walk. Other facilities in the village include butchers, bakers, Post Office, hairdressers, art and craft galleries. 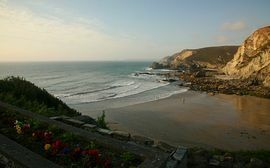 The nearest beach, Trevaunance, is approximately 10 minutes walk away or there is a car park close by. Sorry, no smoking or pets. £500.00 - £900.00 per week.